It's been yet another busy, busy, busy week for Brooklyn Beckham, who has been out and about living the 'Life of Riley'. This week Brooks has been spotted hitting the after parties at the London Brit Awards with his lovely cousin Liberty. They headed to the DSquared2 VIP room, where the Warner Music Group and Ciroc Vodka party was in full swing. Brooklyn was also seen doing a spot of shopping on London's Gloucester Road, where we was buying some accessories for his skateboard at Slick Willies Skate Shop. In fact, he was hard to miss, because he was wearing his favourite pale pink hoodie once again. 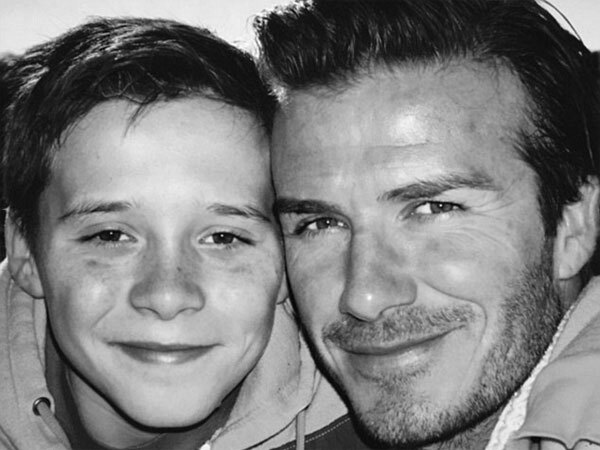 Being the oldest son of one of the world's most famous celebrity couples, David and Victoria Beckham, it is hardly surprising that Brooklyn has found himself many celebrity friends over the years. The other day he was spotted hanging out with Rocco Ritchie, the son of Madonna and Guy Ritchie. The two teenage boys were joined by some pals and headed off in the direction of Brooklyn's home, a rather large and impressive mansion in Notting Hill. Brooklyn posted a black and white birthday selfie snap of himself sitting in a chair - on Instagram. He was wearing a hoodie with an unusual butterfly pattern, as well as a stylish palm tree cap. He has already said that he is very much looking forward to getting behind the wheel for his first driving lesson - watch out Notting Hill, there's a new learner driver on the roads!